WASHINGTON, DC – Following today’s release of an Associated Press investigation into the illegal timber trade from Peru to the United States, the Environmental Investigation Agency requests the Peruvian government to provide for the safety of former chief forest inspector Rolando Navarro and his family, to ensure he can return to Peru after 15 months in exile. 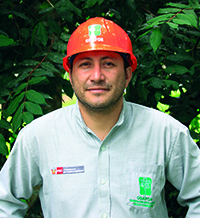 During his tenure as president of the Peruvian forest oversight agency OSINFOR, Navarro and his team worked tirelessly to document and stop the illegal timber logging and trade in Peru, even in the face of threats to his life. His work culminated in the largest seizure of illegal Amazon forest timber in the United States in September 2015 through enforcement of the U.S. Lacey Act. However, rather than cracking down on the rampant corruption and organized crime in the forest sector, Peru’s previous administration decided to “kill the messenger” and fired Rolando Navarro, whose agency OSINFOR was in charge of identifying the illegal harvesting. EIA also demands the U.S. and Peruvian governments strengthen efforts to fight the documented and ongoing illegal timber harvesting and international trade. Since 2014 Operation Amazonas, a special operation lead by the Peruvian customs office SUNAT, with the support of Interpol and the World Customs Organization, have demonstrated that it is feasible to verify the legal – or illegal – origin of timber being exported from Peru. In 2016, after Peru responded to a U.S. government petition by documenting that over 80% of a timber shipment to the United States in January 2015 was illegal, the Peruvian government committed to modify norms – including exports documents – to ensure traceability of the timber from harvest to export. This measure is still in process and must be implemented without delay. In a world where end-markets are increasingly forbidding the trade of illegally harvested products, through laws such as the Lacey Act in the United States or the EUTR in Europe, countries whose timber shipments are known to have a high risk of illegality will eventually run out of destinations for their exports.